After two decades of experiments, scientists working at CERN‘s ALPHA experiment have finally visualized the light spectrum emitted by antimatter, fulfilling a long-standing goal of particle research. “Using a laser to observe a transition in antihydrogen and comparing it to hydrogen to see if they obey the same laws of physics has always been a key goal of antimatter research,” said Jeffrey Hangst, Spokesperson of the ALPHA collaboration. Antimatter is a strange thing. It is a material composed of anti-particles with the same mass as ordinary particles but opposite charges, lepton numbers, and baryon numbers (leptons and baryons are subatomic particles). As the name puts it, they are similar but exactly opposite to regular matter. A mirror reflection, so to speak. We know antimatter exists, we’ve seen it in the lab, but why the universe is filled with matter and virtually completely devoid of antimatter is anyone’s guess. The fact that antimatter is so hard and expensive to produce in a lab makes it even harder to study this mystery – and yet, modern particle theory predicts that every single particle in the universe has its own opposite antiparticle. This is one of the biggest unsolved problems in physics. Atoms consist of electrons orbiting around a nucleus. When the electrons move, they emit and absorb light at different frequencies, representing the atom’s spectrum. Every element has its own unique spectrum, through which it could be identified, and the study of these spectra (called spectroscopy) has numerous applications in chemistry, physics, and astronomy. But what about antimatter? The Antihydrogen Laser Physics Apparatus, or ALPHA experiment at CERN captured 14 or so antihydrogen atoms per trial and blasted them with a laser to see what kind of light they absorb. 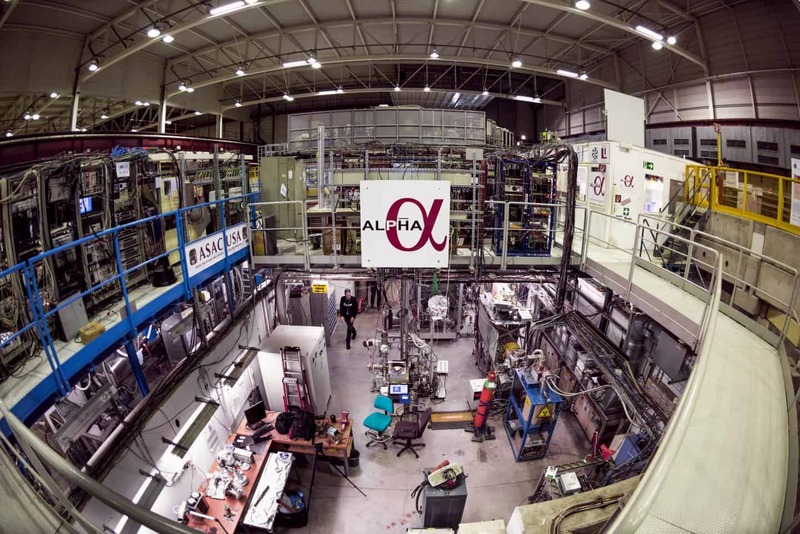 ALPHA is a unique experiment at CERN, able to produce antihydrogen atoms and hold them in a specially-designed magnetic trap, manipulating antiatoms a few at a time. Trapping antihydrogen atoms allows them to be studied using lasers or other radiation sources. As expected (and hoped), the spectrum of anti-hydrogen was identical to that of hydrogen. “It’s long been thought that antimatter is an exact reflection of matter, and we are gathering evidence to show that is indeed true,” Tim Tharp from ALPHA told Ryan F. Mandelbaum at Gizmodo. I say “hoped” because if the spectra didn’t turn out to be identical, then it would mean that much of what we hold as true today – including the Big Bang theory and Einstein’s special relativity – wouldn’t hold up. Special relativity assumes that a single unified thing called spacetime splits differently into space and time for observers moving relative to each other. The spectra were identical, which means that the theory of relativity passed yet another difficult test. But researchers are already planning to create more antimatter and blast it with a different type of laser, to observe even more spectra. Particle physics is a bizarre and complicated world and we are only now getting the chance to test theories proposed many decades ago.The fact that these theories are holding op, that researchers got so many things right only through theory is a testament to the brilliant mind which contributed to this field of science.